Episode #66: Superman In The Pocket Universe! (Top L - R:) Cosmic Boy mini-series, Legion Of Super-Heroes 37, Superman (vol. II) 8, Action Comics 591. 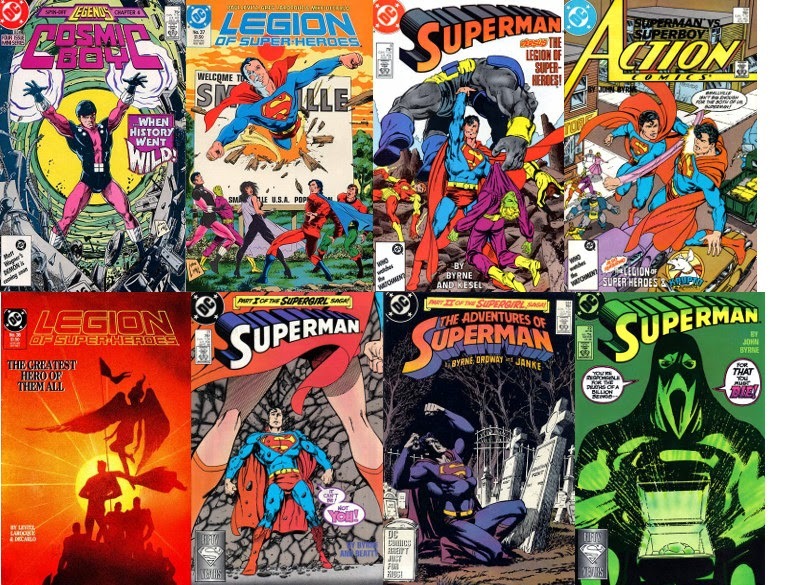 (Bottom L - R:) Legion Of Super-Heroes 38, Superman 21, The Adventures Of Superman 444, Superman 22. The stories involving Superman in the Pocket Universe are a sort of prequel to the SUPERMAN IN EXILE storyline from the early 1990's, now collected in one edition by DC Comics. The events in the pocket universe lead up to Superman exiling himself from Earth. Expanded show notes can be found at http://supermanfanpodcast.blogspot.com . Send your e-mail to supermanfanpodcast@gmail.com . MY PULL LIST is my spoiler free comic book review blog of the titles I read every week. It can be found at http://mypulllist.blogspot.com . Send your e-mail about this blog to mypulllist@gmail.com . Episode #65: You Are Now Entering The Phantom Zone! The Phantom Zone has returned to current Superman continuity. This episode explores the details of the pre- and post-Crisis Phantom Zone and some of its inhabitants. MY PULL LIST is my spoiler free comic book review blog of the titles I read every week. It can be found at http://mypulllist.blogspot.com. Send e-mail about this blog to my pulllist@gmail.com . Episode #64: Happy Birthday, Perry White! Perry White's birthday is on March 12, according to http://supermanhomepage.com . This episode features Perry White's pre- and post- Crisis life and career. Send e-mail to supermanfanpodcast@gmail.com . Expanded show notes can be found at http://supermanfanpodcast.blogspot.com . Episode #63: The Return Of The Silver Age Superman! Elements of the silver age Superman have been reappearing in current Superman stories, especially in the last few months. This episode is dedicated to the first appearances of some people, object and places from Superman's silver age continuity. Also, for a look at a discovery of the REAL Fortress of Solitude, click on this link: http://www.technovelgy.com/ct/Science-Fiction-News.asp?NewsNum=1143#cave .